Today is National Cheese Lover's Day! I love cheese almost as much as I love sugar so when the Wisconsin Milk Marketing Board asked me if I would be interested in creating a unique mac and cheese recipe to share on their 30 Ways in 30 Days Macaroni & Cheese blog to celebrate National Cheese Lover's Day, I could not have been happier. I can't tell you the number of times I've wanted to eat mac and cheese for breakfast, not leftover mac and cheese but fresh from the oven mac and cheese that tastes like breakfast. This recipe combines all my favorite breakfast add-ins into a delicious mac and cheese. I decided to go with Wisconsin Colby Jack, a mild cheese that would be perfect in a savory breakfast dish. I used all the usual ingredients you would find in an omelette like sausage, onions, peppers, cheese and eggs and then combined them with pasta and crumbled biscuit pieces. The sweet breakfast sausage, creamy Colby Jack and spice from the jalapeno and Pepper Jack Cheese seriously makes this dish taste like the best breakfast casserole you have ever had. You might even eat mac and cheese for breakfast instead of dinner from now on. Or both, I won't judge! 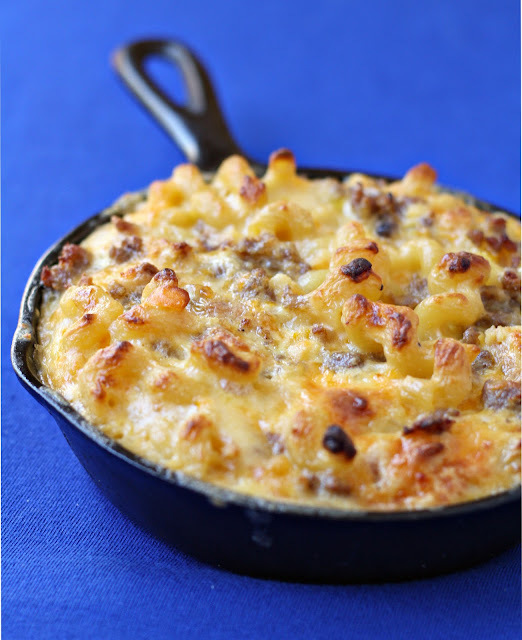 Check out the Macaroni & Cheese blog for the next 29 days to see what mac and cheese creations other participating food bloggers came up with! Bring a large pot of salted water to a boil. Add the pasta and cook until al dente, about 10 minutes. In a large skillet over medium-high heat, cook the sausage until browned. Remove sausage from the pan, drain the fat off and set sausage aside. In the same skillet, add the onion, peppers and garlic salt and cook over medium-high heat until softened. Add the garlic and cook for 1 minute. Remove onion and pepper mixture from heat and set aside. Add butter to the same skillet and stir constantly until melted. Add the flour and stir constantly over medium heat for 3-4 minutes. Slowly pour in the milk and whisk continuously until it is smooth and has thickened, about 4-6 minutes. Remove skillet from the heat and stir in 4 cups of colby jack and 1/2 cup of pepper jack along with salt and pepper to taste. Add the pasta, cooked sausage, onion/pepper mixture to the cheese mixture and stir until combined. Pour into a large buttered baking dish. In a small bowl, whisk all the eggs together. Add in remaining cheese and crumbled biscuits, stir until combined. Pour this mixture over the pasta in the baking dish. Bake for 25-30 minutes or until golden brown and bubbly. Let stand for 10 minutes before serving. Disclosure: This post was sponsored by the Wisconsin Milk Marketing Board. I received compensation for ingredients and my time but all thoughts and opinions are my own. My favorite is Cotswold cheese! I don't know any recipes to use it in other than as a hors d'oeuvre....so if you have any ideas! How did I miss that today was cheese lover's day!? Good thing I eat cheese all the time anyway :-). I am in love with this by the way and would've loved to have it this morning. Or for lunch. My favorite cheese is probably sharp white cheddar. I can never keep up with all the food holidays, there are so many! But I'll remember this one from now on! My boyfriend would love this, mac and cheese is one of his favorite meals! Well if you make it, let me know what you guys think! Just found your blog through foodgawker and so glad I did! I love the look and feel of your blog! My favorite cheese is probably smoked gouda. Or anything spicy really. I love breakfast. I love mac n' cheese. I know I'll love this recipe! i ate this for breakfast all last week! haha thanks for making it for me Shan! Eating this much cheese & pasta is perfect for the morning because then you have all day to work it off, this is awesome!! I'm so upset I missed Cheese Lovers Day - I eat cheese on pretty much anything. This looks amazing! Just found this amazingness on foodbuzz -- OMG Shannon it looks and sounds amazing!!!!!! I cooked this last night! OMG, it's perfect for dinner too! Thanks for sharing. This looks delicious. Could you get it ready for the oven the night before and stick it in the fridge overnight? I made this for Father's Day yesterday. Oh my it is amazing!! Definitely a lot of steps to prepare it, but totally worth it! Thanks for sharing! “If you have to narrow Replica handbags sleeves worn or tightening cuffs, you, thinner, you may need to watch” can feel or off healthy overall handbag replica appearance, he said.A typical example: look mysterious movement of. Replica Watches , I floating in the air hand appeared. “This is, they is a someone who will tell you thatthey are wearing a Rolex Daytona , I would like to talk about it,” he said.Crocodile Mr. that some of the people to Replica watches UK work better than the evening. Good post. I’m verifying regularly this blog with this particular empowered! Very useful information precisely the remainder of the sections. I personally handle like information a whole lot. I was searching for this kind of details for any number of years. Thanks a lot plus all the best.